With three extremely spoiled dogs in this house, there are plenty of dog toys strewn about. 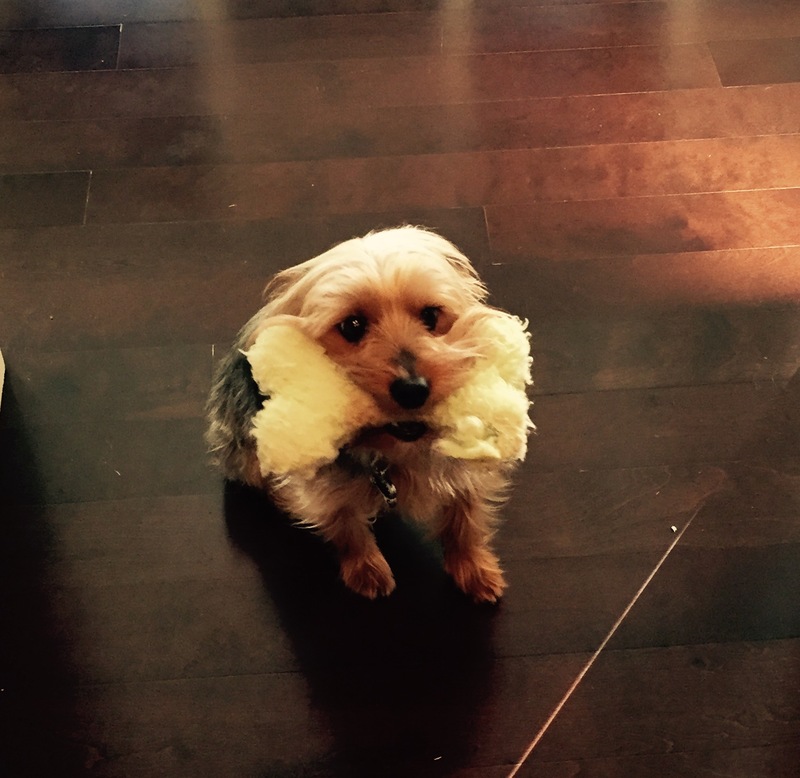 But, for some reason, our silky terrier, Bernie, always runs off to grab one particular fuzzy bone whenever she hears somebody come home. She returns to greet them with this fuzzy bone in her mouth — we call it her “Baby” and she even knows it by this name — complete with her ears back and her tail wagging like crazy. She never actually drops it. She just presents it. When you pick her up, she keeps it in her mouth, grunting and coughing because she’s breathing hard from excitement but just won’t drop Baby from her mouth. I’m not sure what that means in the dog world, but in the human world, I call this adorable. Our boys absolutely adore Bern and she adores them. Period. We got her as a puppy four years ago, so she has grown up with them — we all know the lore of boys and their dogs. I’m not sure what doggy depression looks like but when the oldest two left for college this past August, she sat in the chair by the window in my office so long that I could barely take it any more. She learned the distinct “beep” sound their car makes when they hit the auto-lock button on their key fob, signifying they are home — so she always let out a yelp and went to find Baby. 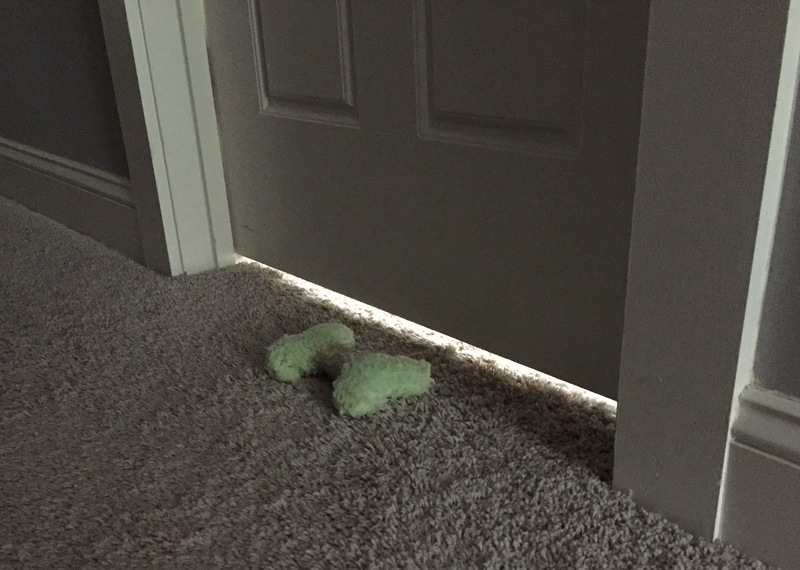 Of course, the kid next door drives the same car, so the first month they were gone, she’d hear that same beep, jump up to dash off and get Baby, and then wait by the front door with her tail wagging. But they never came in the door, so she’d eventually just drop Baby and return to the chair. Nowadays, that beep gets a couple of ears flying forward, but she peers at the kid next door, watching to see which house he heads toward. You cannot say their names without her ears shooting up and her head turning slightly. Only the third son is at home now, and every weekday she waits in the chair by the window for him to come walking down the sidewalk from school — just as she did with the other two. The instant she sees him, she dashes off to get Baby, of course — just as she did with the other two. Sometimes one of the college kids returns home for a quick visit, but seldom are both home at the same time. This past weekend, however, both of them came home. I thought Bern’s head might explode. When they are home, she follows them everywhere and sits next to them when they play video games or watch TV. When they finally shut the TV off and go to bed in the middle of the night, she leaves our bed to go sleep with them in their beds. This past Saturday night, Bern went to sleep with them. Only she found their door closed. So she left a message, then crawled back into our bed. And that’s why we all stand at the window when they leave again, awaiting the day they’ll be coming back. Of course Bernie goes to your sons’ beds when they are home and run to the door when he hears that they may have arrived. He’s trying to get away from you. You probably scare him. There’s nothing quite like getting harassed by a guy with an AOL address. It probably took you 20 minutes to write your comment on your dial-up modem, too. Leaving her Baby there as a gift to say “I miss you and present you with Baby to keep you safe on your travels” is an amazing gesture even translated into human terms.